For Swiss metal band Ravenheart it has been 10 years from inception to the studio and their first full length studio album, 'Valley Of The Damned.' 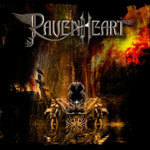 If patience and persistence is anything, then it has paid off for Ravenheart. they have been helped on this first work by some serious European musical heavyweights including Chris Bay (Freedom Call), Cede Dupont (Symphorce), Oliver Hartmann (Hartmann & Avantasia), and Werner Schweizer (Kharma). Notable producer and engineer Tommy Newton (Helloween, Gamma Ray, Freedom Call & Victory) handled the mixing of 'Valley Of The Damned.' Needless to say, with such a compliment of players, expectations are high for this band. Generally, Ravenheart fares well on 'Valley Of The Damned.' Much of this is due to two key characteristics. The first is the simple emphasis on melody throughout the work. Sure, the compositions contain strong riffs and a surging rhythm section at times, but never is the melody lost in the arrangements. The foundation of this melodic metal is found in the second important feature which is the strong vocals and vocal arrangements. Frankly, I haven't heard such profound and epic vocal arrangements in a long time. When joined with some amazing instrumentation and performance as on 'Reborn,' 'Fly Away,' or the masterful and astonishing, 'Lords Of Power,' you have some epic and enjoyable moments. With this well-deserved praise, I must still note that 'Valley Of The Damned' is still characteristically European melodic power metal. Therefore, in one sense, there is nothing new under the sun here. What is here is great promise. With the strength of their powerful melodic vocal arrangements complimented by aggressive melodic metal, Ravenheart could distinguish themselves from other power metal bands. If they play to their strengths, Ravenheart will break out from the crowd. Very recommended. 'Valley Of The Damned' is a strong debut for Swiss melodic power metal band, Ravenheart. Their strength lies in their simple pursuit of melodic metal and this is founded in rich and epic vocal arrangements. 'Valley Of The Damned' is a good start and a promise for a great future.